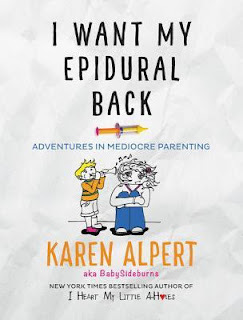 As someone who often considers myself a mediocre parent, I was quite eager to give Karen Alpert's book, I Want My Epidural Back, a try. Besides, as tough as parenting can be sometimes, it is necessary to find the humor in it. I don't often indulge in books like this, admittedly, but it sounded like fun. The author blogs at Baby Sideburns, a blog, I was not aware of before reading this book. I found the best way to read this one was in small doses, a section or two at a time in between the more serious books I was reading at the time. While there were some over the top moments in the book, overall, I found myself laughing and nodding along often. The chapter about becoming a Girl Scout Leader? I can relate! I've been known to wash all my clothes in cold water so I can do fewer loads of laundry. It's clear the author loves her children. While there is colorful language and a cringe-worthy nickname or two for her kids (it's probably just me), I found Alpert's book entertaining and relatable. I appreciate her honesty and humor. You can learn more about Karen Alpert and her books on the author's website. I know you're a great mom! I think I might be a little too old for this book. Kathy - Aw, thanks, Kathy! I don't know you might still be able to relate. :-) I am glad I waited to read it now though actually, now that my daughter is older, but still young for much of her experiences to be my present day reality. You are not mediocre! I see your photos and all that you do. Why do we do that to ourselves? The book sounds funny. Debbie - I put up a good front! Haha. This is a funny book, although I definitely found it best read in small doses. I think we all think we're mediocre at times but we're not! We're fantastic! Just the title of this one makes me laugh and I'm glad you enjoyed this one. I'm picky about "funny" books so I'm always a little hesitant but this sounds worth a try! Katherine - I think if I had read this straight through it would have been a bit much, although it is short. The nicknames did made me cringe, and the language is quite colorful. If you can look past that, you might enjoy this one. Sometimes reading a book like this is good because it's so relateable. Christy - That's pretty much how I felt reading this one. I don't read this type of book often, but sometimes I think I need to. Jenclair - Isn't that the truth?! I think we have to laugh and be able to see the humor in the challenges sometimes or else it will drive us crazy. This one sounds like a good one. Ugh, I've had two epidurals in my life during labor, and please never again lolol. Ouch!! For that title alone, I would have stopped to have a look! This sounds funny and thoughtful at the same time -- and I am certain you are a great mum! I often find I need some humor to break up the heavier stuff - this one sounds like just the ticket.